Chinese investors face two major changes in US policy: Congress is expanding the national security investment review regime through the Committee on Foreign Investment in the United States (CFIUS); and the Trump administration is threatening additional investment restrictions as part of the Section 301 investigation into Chinese intellectual property practices. This note reviews 1H 2018 patterns of Chinese FDI in the US and analyzes the outlook. The drop in Chinese FDI in the US is real and persistent: In the first half of 2018, Chinese companies completed acquisitions and greenfield investments worth only $1.8 billion – a drop of more than 90% from 1H 2017 and the lowest level in seven years. The pace of newly announced transactions remained similarly depressed. Cumulative 2018 net Chinese FDI in the US is negative if one includes asset divestitures: Chinese investors sold $9.6 billion of US assets in the first five months of 2018, mostly driven by deleveraging pressures from Beijing. With these divestitures, China’s net US direct investment is negative to the tune of $7.8 billion so far this year. After a record $46 billion of completed Chinese foreign direct investment (FDI) in the US in 2016, Chinese investment dropped sharply to just $29 billion in 2017 due to greater scrutiny in Beijing over outbound flows as well as tougher US regulatory reviews of inbound acquisitions. One of the big questions for businesses, intermediaries and local US governments is whether the 2017 drop reflected a short-term correction or the beginning of a protracted period of lower Chinese capital deployment in the US. We have previously argued we are experiencing a more profound shift, and the latest data confirm this view: from January to May 2018, Chinese companies only invested $1.8 billion in greenfield projects and acquisitions in the United States, a drop of 92% from the same period in 2017 and the lowest half-year figure in seven years (Figure 1). 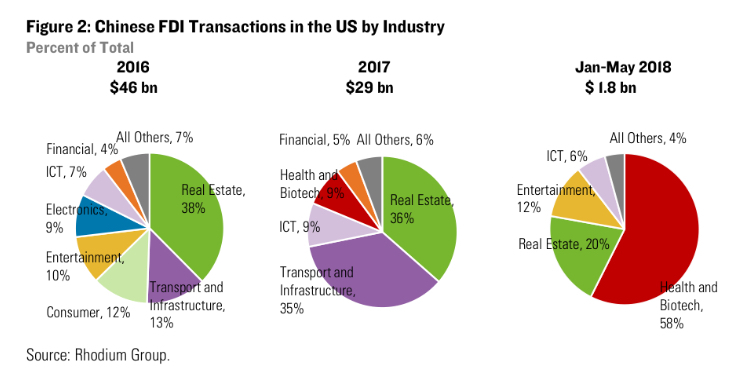 The number of transactions has also markedly declined, dropping from a bi-annual average of 84 since 2014 to 69 in 2H 2017 and just 39 in 1H 2018, the lowest level in six years. 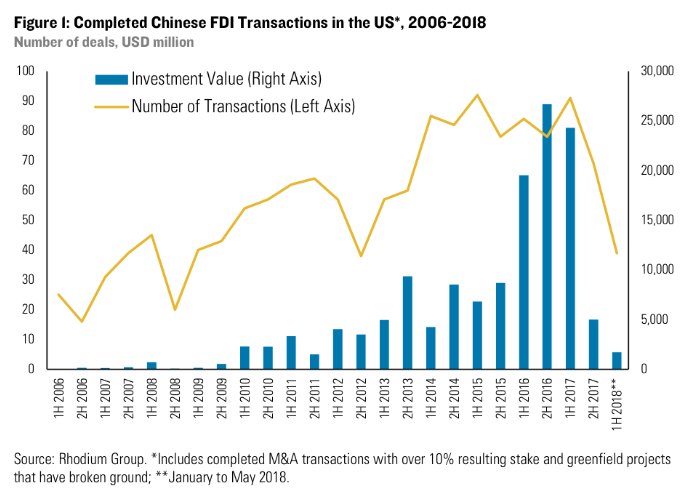 As discussed in our 2017 Update, the rapid decline in Chinese FDI was driven by a “double policy punch” – Beijing cracking down on rapid outbound investment (especially by a few highly leveraged private investors) and the US government increasing scrutiny on Chinese acquisitions through CFIUS as well as taking a more confrontational stance toward economic engagement with China in general. These same factors are causing the amplified depression of Chinese investment in the first half of 2018. Private investors, which have traditionally driven Chinese FDI in the US, remain constrained by capital controls and tighter financial conditions at home, as evidenced by the low average size of 1H 2018 transactions ($46 million). CFIUS and other US regulators are also now a major hurdle for Chinese investors to complete pending transactions, having derailed acquisitions worth more than $2 billion in the first five months of the year (Table 1). Not only have Chinese companies invested less, they have also divested assets at an unprecedented pace so far in 2018. The 2015-2016 outbound investment boom was in no small part driven by a handful of private firms seeking to diversify their holdings and exploit arbitrage opportunities arising from differentials between Chinese and global asset prices. Many of these firms are now being forced to divest their overseas holdings by a broader financial tightening in China that is limiting the rollover of debt financing as well as specific regulatory action to reduce the leverage of systemically important private conglomerates. Several of the impacted firms – particularly HNA, Anbang and Wanda – are heavily invested in the US economy, and they have started to put their assets up for sale. HNA drove this reversal in the first half of 2018, selling off several of its US holdings including office buildings in New York and San Francisco and its stake in Hilton Worldwide. Wanda is in the process of selling its Vista Tower in Chicago and One Beverly Hills in Los Angeles. Anbang, which has been taken over by the state insurance regulator, is also rumored to be looking to off load its US assets. We count $9.6 billion of completed US divestitures by Chinese firms in the first five months of 2018, with another estimated $4 billion of sales pending. Counting completed divestitures, Chinese net FDI inflows to the US were negative to the tune of $7.8 billion in the first five months of 2018. The industry composition of Chinese investment has also shifted remarkably in the first five months of 2018. For the first time, the health and biotech sector was the top destination for Chinese FDI in the US thanks to Shandong Weigao’s $850 million acquisition of Argon Medical Devices and six other transactions. Despite Chinese capital controls, real estate and hospitality remained the second largest recipient of Chinese capital driven by mid-sized deals in hotels and commercial real estate. Entertainment – which is also heavily scrutinized by Beijing – rounded out the top 3 sectors, mostly driven by internet and gaming companies listed overseas (e.g. Tencent, Netease) that do not need to apply to take capital offshore to finance overseas transactions. At the same time, looming US policies present substantial headwinds to a possible rebound of Chinese investment activity. First is the Foreign Investment Risk Review Modernization Act (FIRRMA), which aims to modernize the scope and process of CFIUS security screenings and is now at an advanced stage. While FIRRMA will not heavily impact Chinese buyouts of US companies (M&A resulting in stakes of 10% or more are already covered), the new legislation would raise hurdles for other investment modes like venture capital. Importantly, it would also task the Department of Commerce with more strictly controlling outbound transfers of technology. This greater scrutiny on the transfer of US-developed technology and know-how would disincentivize Chinese greenfield FDI in research and development (R&D) facilities and other innovation-intensive activities, especially in technologies with potential military applications such as autonomous driving, machine learning or semiconductors. Finally, while the FIRRMA legislation was shaped and honed by a robust public debate and extensive legislative due process, the White House is threatening additional action that is far less predictable. As part of the determination of the Section 301 investigation into Chinese intellectual property practices, the Trump administration has threatened to impose additional restrictions on Chinese investment. The Treasury Department was tasked to draft a proposal by June 30th, but no one is remotely sure what the unpredictable administration will do. With a proper legislative debate on national security risks already underway, it is possible that any supplemental action will enter uncharted territory of economic security notions (including reciprocity), which CFIUS has taken pains to avoid wading into over the past four decades.